To comply with business standards and industry regulations, organizations need to protect sensitive information and prevent its inadvertent disclosure. Examples of sensitive information that you might want to prevent from leaking outside your organization include financial data or personally identifiable information (PII) such as credit card numbers, social security numbers, or health records. With a data loss prevention (DLP) policy in the Office 365 Security & Compliance Center, you can identify, monitor, and automatically protect sensitive information across Office 365. Identify sensitive information across many locations, such as Exchange Online, SharePoint Online, OneDrive for Business, and Microsoft Teams. For example, you can identify any document containing a credit card number that's stored in any OneDrive for Business site, or you can monitor just the OneDrive sites of specific people. Prevent the accidental sharing of sensitive information. For example, you can identify any document or email containing a health record that's shared with people outside your organization, and then automatically block access to that document or block the email from being sent. Monitor and protect sensitive information in the desktop versions of Excel, PowerPoint, and Word. Just like in Exchange Online, SharePoint Online, and OneDrive for Business, these Office desktop programs include the same capabilities to identify sensitive information and apply DLP policies. DLP provides continuous monitoring when people share content in these Office programs. Help users learn how to stay compliant without interrupting their workflow. You can educate your users about DLP policies and help them remain compliant without blocking their work. For example, if a user tries to share a document containing sensitive information, a DLP policy can both send them an email notification and show them a policy tip in the context of the document library that allows them to override the policy if they have a business justification. 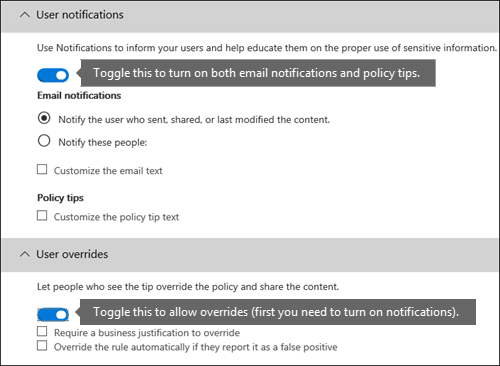 The same policy tips also appear in Outlook on the web, Outlook, Excel, PowerPoint, and Word. View DLP reports showing content that matches your organization's DLP policies. 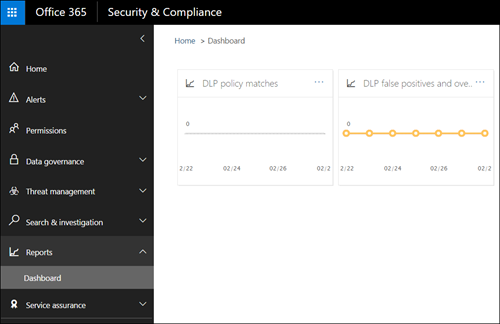 To assess how your organization is complying with a DLP policy, you can see how many matches each policy and rule has over time. If a DLP policy allows users to override a policy tip and report a false positive, you can also view what users have reported. 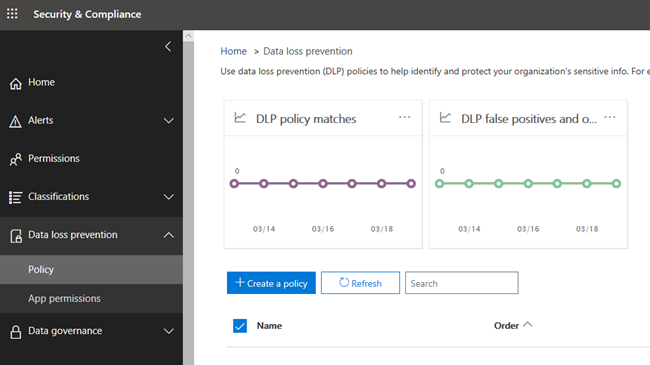 You create and manage DLP policies on the Data loss prevention page in the Office 365 Security & Compliance Center. 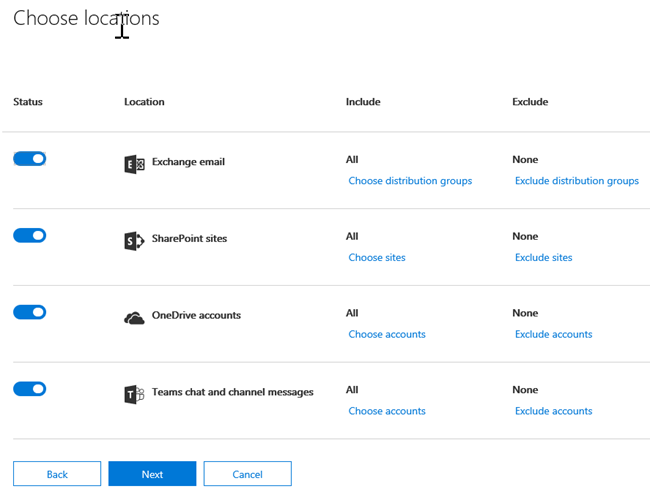 Where to protect the content: locations such as Exchange Online, SharePoint Online, and OneDrive for Business sites, as well as Microsoft Teams chats and channels. Conditions the content must match before the rule is enforced. For example, a rule might be configured to look only for content containing Social Security numbers that's been shared with people outside your organization. Actions that you want the rule to take automatically when content matching the conditions is found. For example, a rule might be configured to block access to a document and send both the user and compliance officer an email notification. You can use a rule to meet a specific protection requirement, and then use a DLP policy to group together common protection requirements, such as all of the rules needed to comply with a specific regulation. For example, you might have a DLP policy that helps you detect the presence of information subject to the Health Insurance Portability and Accountability Act (HIPAA). 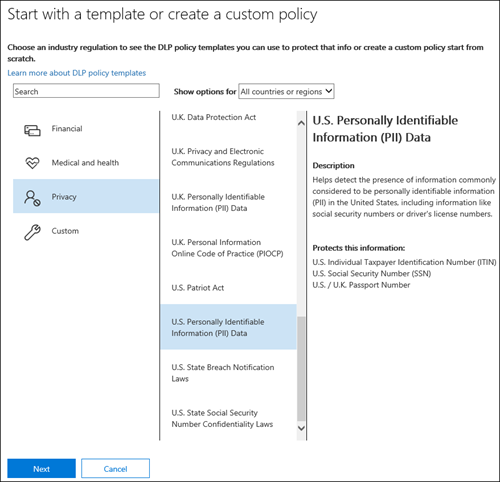 This DLP policy could help protect HIPAA data (the what) across all SharePoint Online sites and all OneDrive for Business sites (the where) by finding any document containing this sensitive information that's shared with people outside your organization (the conditions) and then blocking access to the document and sending a notification (the actions). These requirements are stored as individual rules and grouped together as a DLP policy to simplify management and reporting. 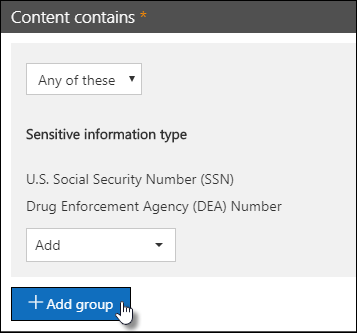 A DLP policy can find and protect sensitive information across Office 365, whether that information is located in Exchange Online, SharePoint Online, OneDrive for Business, or Microsoft Teams. 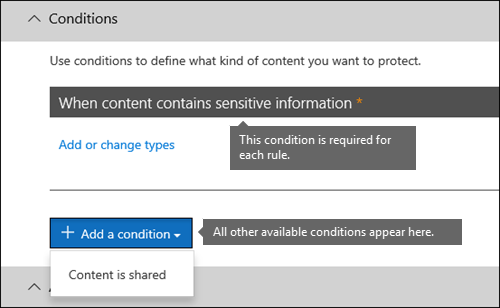 You can choose to protect content in Exchange email, Microsoft Teams chats and channels, and all SharePoint or OneDrive libraries, or select specific locations for a policy. 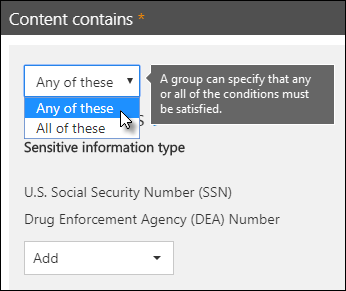 Note that if you choose to include or exclude specific SharePoint sites or OneDrive accounts, a DLP policy can contain no more than 100 such inclusions and exclusions. Although this limit exists, understand that you can exceed this limit by applying either an org-wide policy or a policy that applies to entire locations. Rules are what enforce your business requirements on your organization's content. A policy contains one or more rules, and each rule consists of conditions and actions. For each rule, when the conditions are met, the actions are taken automatically. Rules are executed sequentially, starting with the highest-priority rule in each policy. A rule also provides options to notify users (with policy tips and email notifications) and admins (with email incident reports) that content has matched the rule. Here are the components of a rule, each explained below. Conditions are important because they determine what types of information you're looking for, and when to take an action. For example, you might choose to ignore content containing passport numbers unless the content contains more than ten such numbers and is shared with people outside your organization. Conditions focus on the content, such as what types of sensitive information you're looking for, and also on the context, such as who the document is shared with. You can use conditions to assign different actions to different risk levels -- for example, sensitive content shared internally might be lower risk and require fewer actions than sensitive content shared with people outside the organization. Content contains a type of sensitive information. Content contains a label. For more information, see the below section Using a label as a condition in a DLP policy. Content is shared with people outside or inside your organization. A DLP policy can help protect sensitive information, which is defined as a sensitive information type. 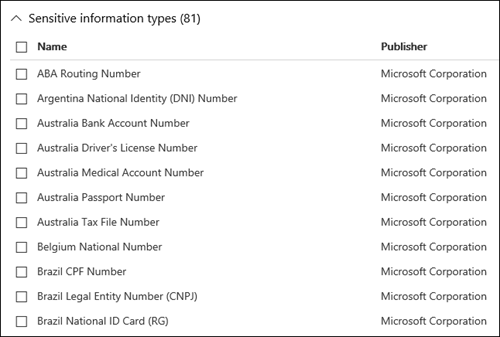 Office 365 includes definitions for many common sensitive information types across many different regions that are ready for you to use, such as a credit card number, bank account numbers, national ID numbers, and passport numbers. This helps DLP detection achieve a high degree of accuracy while reducing the number of false positives that can interrupt peoples' work. When content matches a condition in a rule, you can apply actions to automatically protect the content. Restrict access to the content For site content, this means that permissions for the document are restricted for everyone except the primary site collection administrator, document owner, and person who last modified the document. These people can remove the sensitive information from the document or take other remedial action. When the document is in compliance, the original permissions will be automatically restored. 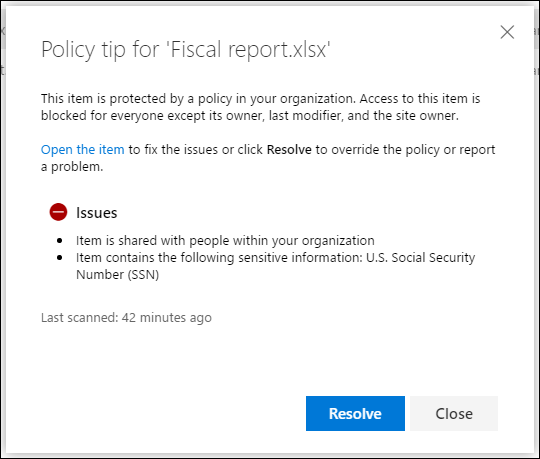 When access to a document is blocked, the document appears with a special policy tip icon in the library on the site. For email content, this action blocks the message from being sent. Depending on how the DLP rule is configured, the sender will see an NDR or (if the rule uses a notification) a policy tip and/or email notification. You can use notifications and overrides to educate your users about DLP policies and help them remain compliant without blocking their work. For example, if a user tries to share a document containing sensitive information, a DLP policy can both send them an email notification and show them a policy tip in the context of the document library that allows them to override the policy if they have a business justification. The email can notify the person who sent, shared, or last modified the content and, for site content, the primary site collection administrator and document owner. In addition, you can add or remove whomever you choose from the email notification. In Outlook and Outlook on the web. For the document on a SharePoint Online or OneDrive for Business site. In Excel, PowerPoint, and Word, when the document is stored on a site included in a DLP policy. The email notification and policy tip explain why content conflicts with a DLP policy. 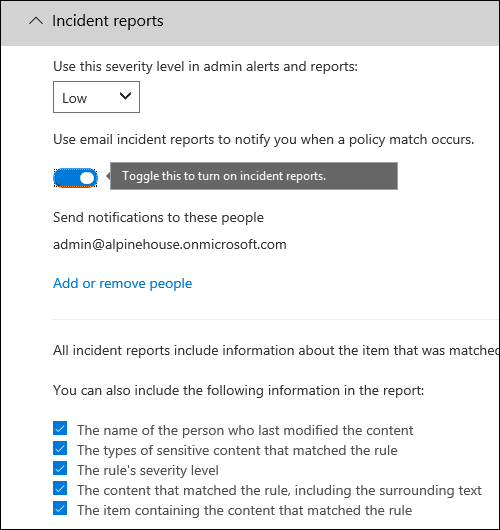 If you choose, the email notification and policy tip can allow users to override a rule by reporting a false positive or providing a business justification. This can help you educate users about your DLP policies and enforce them without preventing people from doing their work. Information about overrides and false positives is also logged for reporting (see below about the DLP reports) and included in the incident reports (next section), so that the compliance officer can regularly review this information. 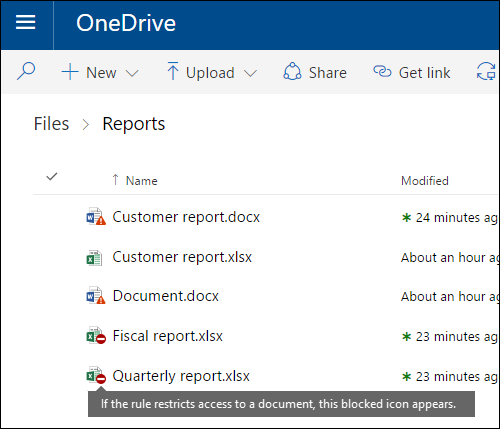 Here's what a policy tip looks like in a OneDrive for Business account. When a rule is matched, you can send an incident report to your compliance officer (or any people you choose) with details of the event. This report includes information about the item that was matched, the actual content that matched the rule, and the name of the person who last modified the content. For email messages, the report also includes as an attachment the original message that matches a DLP policy. Often your DLP policy has a straightforward requirement, such as to identify all content that contains a U.S. Social Security Number. However, in other scenarios, your DLP policy might need to identify more loosely defined data. Content that contains specific types of sensitive information, such as a U.S. Social Security Number or Drug Enforcement Agency (DEA) Number. Content that's more difficult to identify, such as communications about a patient's care or descriptions of medical services provided. Identifying this content requires matching keywords from very large keyword lists, such as the International Classification of Diseases (ICD-9-CM or ICD-10-CM). Choose the logical operator between the sensitive information types within a group and between the groups themselves. Within a group, you can choose whether any or all of the conditions in that group must be satisfied for the content to match the rule. You can quickly add a group, which can have its own conditions and operator within that group. Between groups, you can choose whether the conditions in just one group or all of the groups must be satisfied for the content to match the rule. When you create rules in a policy, each rule is assigned a priority in the order in which it's created - meaning, the rule created first has first priority, the rule created second has second priority, and so on. After you have set up more than one DLP policy, you can change the priority of one or more policies. To do that, select a policy, choose Edit policy, and use the Priority list to specify its priority. In this example, note that matches for all of the rules are recorded in the audit logs and shown in the DLP reports, even though only the most restrictive rule is enforced. Only the policy tip from the highest priority, most restrictive rule will be shown. 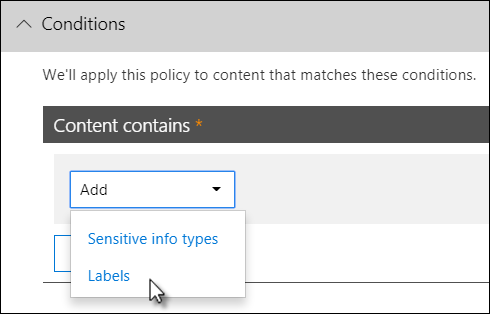 For example, a policy tip from a rule that blocks access to content will be shown over a policy tip from a rule that simply sends a notification. This prevents people from seeing a cascade of policy tips. If the policy tips in the most restrictive rule allow people to override the rule, then overriding this rule also overrides any other rules that the content matched. Too much content that is not sensitive information matches the rules - in other words, too many false positives. Too little content that is sensitive information matches the rules. In other words, the protective actions aren't being enforced on the sensitive information. To address these issues, you can tune your rules by adjusting the instance count and match accuracy to make it harder or easier for content to match the rules. Each sensitive information type used in a rule has both an instance count and match accuracy. Instance count means simply how many occurrences of a specific type of sensitive information must be present for content to match the rule. For example, content will match the rule shown below if between 1 and 9 unique U.S. or U.K. passport numbers are identified. Note that the instance count includes only unique matches for sensitive information types and keywords. For example, if an email contains 10 occurrences of the same credit card number, those 10 occurrences count as a single instance of a credit card number. To make the rule easier to match, decrease the min count and/or increase the max count. You can also set max to any by deleting the numerical value. To make the rule harder to match, increase the min count. Typically, you use less restrictive actions, such as sending user notifications, in a rule with a lower instance count (for example, 1-9). And you use more restrictive actions, such as restricting access to content without allowing user overrides, in a rule with a higher instance count (for example, 10-any). As described above, a sensitive information type is defined and detected by using a combination of different types of evidence. Commonly, a sensitive information type is defined by multiple such combinations, called patterns. A pattern that requires less evidence has a lower match accuracy (or confidence level), while a pattern that requires more evidence has a higher match accuracy (or confidence level). To learn more about the actual patterns and confidence levels used by every sensitive information type, see What the sensitive information types look for. A number in the format of a credit card number. A number that passes the checksum. A keyword or an expiration date in the right format. You can use these confidence levels (or match accuracy) in your rules. Typically, you use less restrictive actions, such as sending user notifications, in a rule with lower match accuracy. And you use more restrictive actions, such as restricting access to content without allowing user overrides, in a rule with higher match accuracy. If all of the matches are for a single pattern, the confidence level for that pattern is returned. If there are matches for more than one pattern (i.e., there are matches with two different confidence levels), a confidence level higher than any of the single patterns alone is returned. This is the tricky part. For example, for a credit card, if both the 65% and 85% patterns are matched, the confidence level returned for that sensitive information type is greater than 90% because more evidence means more confidence. So if you want to create two mutually exclusive rules for credit cards, one for the 65% match accuracy and one for the 85% match accuracy, the ranges for match accuracy would look like this. The first rule picks up only matches of the 65% pattern. The second rule picks up matches with at least one 85% match and can potentially have other lower-confidence matches. The lowest confidence level typically uses the same value for min and max (not a range). The highest confidence level is typically a range from just above the lower confidence level to 100. Any in-between confidence levels typically range from just above the lower confidence level to just below the higher confidence level. Publish it, so that end users can see and manually apply the label to content. Auto-apply it to content that matches the conditions that you choose. For more information about labels, see Overview of retention labels. You published a label named Confidential, so that people in your organization can manually apply the label to confidential email and documents. By using this label as a condition in your DLP policy, you can restrict content labeled Confidential from being shared with people outside your organization. You created a label named Alpine House for a project of that name, and then applied that label automatically to content containing the keywords "Alpine House". By using this label as a condition in your DLP policy, you can show a policy tip to end users when they're about to share this content with someone outside your organization. You published a label named Tax record, so that your records manager can manually apply the label to content that needs to be classified as a record. By using this label as a condition in your DLP policy, you can look for content with this label in conjunction with other types of sensitive information such as ITINs or SSNs; apply protection actions to content labeled Tax record; and get detailed activity reports about the DLP policy from the DLP reports and audit log data. You published a label named Executive Leadership Team - Sensitive to the Exchange mailboxes and OneDrive accounts of a group of executives. By using this label as a condition in your DLP policy, you can enforce both retention and protection actions on the same subset of content and users. By using labels as a condition in your DLP rules, can you selectively enforce protection actions on a specific set of content, locations, or users. Note that you can currently use only a retention label as a condition, not a sensitivity label. We're currently working on support for using a sensitivity label in this condition. A retention label and a retention policy can both enforce retention actions on this content. A DLP policy can enforce protection actions on this content. And before enforcing these actions, a DLP policy can require other conditions to be met in addition to the content containing a label. Note that a DLP policy has a richer detection capability than a label or retention policy applied to sensitive information. A DLP policy can enforce protective actions on content containing sensitive information, and if the sensitive information is removed from the content, those protective actions are undone the next time the content's scanned. But if a retention policy or label is applied to content containing sensitive information, that's a one-time action that won't be undone even if the sensitive information's removed. By using a label as a condition in a DLP policy, you can enforce both retention and protection actions on content with that label. You can think of content containing a label exactly like content containing sensitive information - both a label and a sensitive information type are properties used to classify content, so that you can enforce actions on that content. Simple settings make it easy to create the most common type of DLP policy without using the rule editor to create or modify rules. 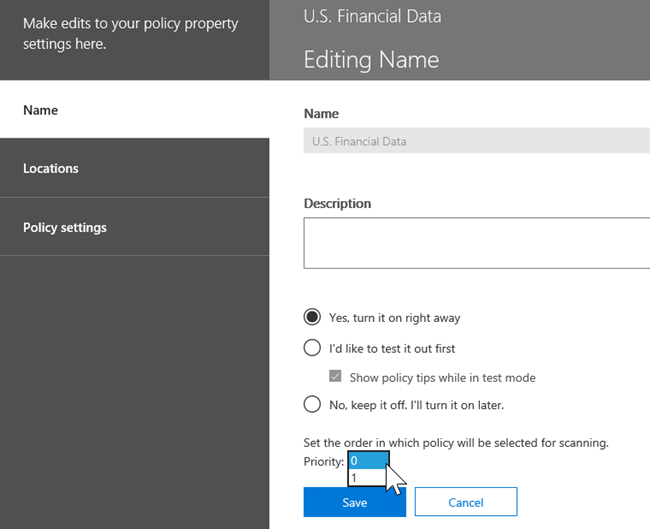 Advanced settings use the rule editor to give you complete control over every setting for your DLP policy. Don't worry, under the covers, simple settings and advanced settings work exactly the same, by enforcing rules comprised of conditions and actions -- only with simple settings, you don't see the rule editor. It's a quick way to create a DLP policy. By far, the most common DLP scenario is creating a policy to help protect content containing sensitive information from being shared with people outside your organization, and taking an automatic remedial action such as restricting who can access the content, sending end-user or admin notifications, and auditing the event for later investigation. People use DLP to help prevent the inadvertent disclosure of sensitive information. To simplify achieving this goal, when you create a DLP policy, you can choose Use simple settings. These settings provide everything you need to implement the most common DLP policy, without having to go into the rule editor. If you need to create more customized DLP policies, you can choose Use advanced settings. The advanced settings present you with the rule editor, where you have full control over every possible option, including the instance count and match accuracy (confidence level) for each rule. To jump to a section quickly, click an item in the top navigation of the rule editor to go to that section below. The first step in creating a DLP policy is choosing what information to protect. By starting with a DLP template, you save the work of building a new set of rules from scratch, and figuring out which types of information should be included by default. You can then add to or modify these requirements to fine tune the rule to meet your organization's specific requirements. A preconfigured DLP policy template can help you detect specific types of sensitive information, such as HIPAA data, PCI-DSS data, Gramm-Leach-Bliley Act data, or even locale-specific personally identifiable information (P.I.). 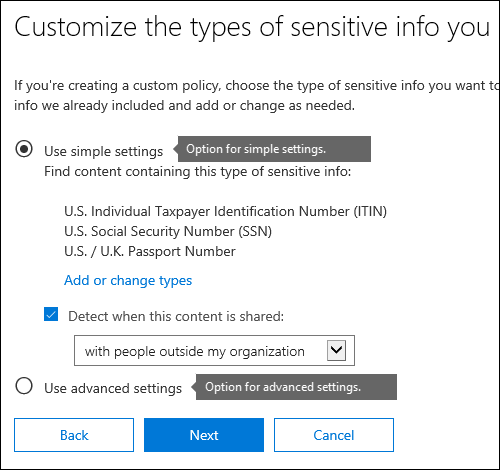 To make it easy for you to find and protect common types of sensitive information, the policy templates included in Office 365 already contain the most common sensitive information types necessary for you to get started. Your organization may also have its own specific requirements, in which case you can create a DLP policy from scratch by choosing the Custom policy option. A custom policy is empty and contains no premade rules. When you create your DLP policies, you should consider rolling them out gradually to assess their impact and test their effectiveness before fully enforcing them. For example, you don't want a new DLP policy to unintentionally block access to thousands of documents that people require access to in order to get their work done. Start in test mode without Policy Tips and then use the DLP reports and any incident reports to assess the impact. You can use DLP reports to view the number, location, type, and severity of policy matches. Based on the results, you can fine tune the rules as needed. In test mode, DLP policies will not impact the productivity of people working in your organization. 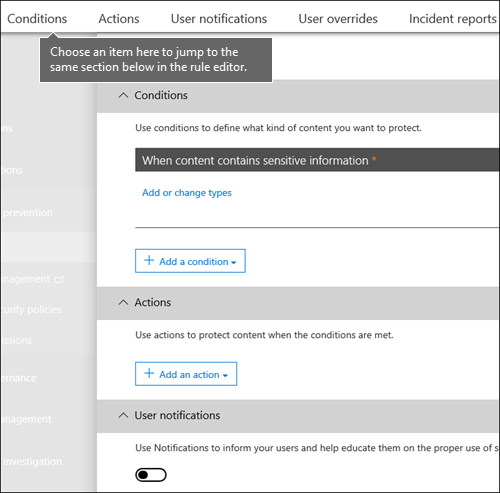 Move to Test mode with notifications and Policy Tips so that you can begin to teach users about your compliance policies and prepare them for the rules that are going to be applied. At this stage, you can also ask users to report false positives so that you can further refine the rules. Start full enforcement on the policies so that the actions in the rules are applied and the content's protected. Continue to monitor the DLP reports and any incident reports or notifications to make sure that the results are what you intend. 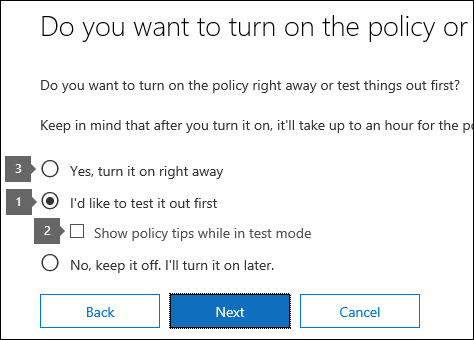 You can turn off a DLP policy at any time, which affects all rules in the policy. However, each rule can also be turned off individually by toggling its status in the rule editor. 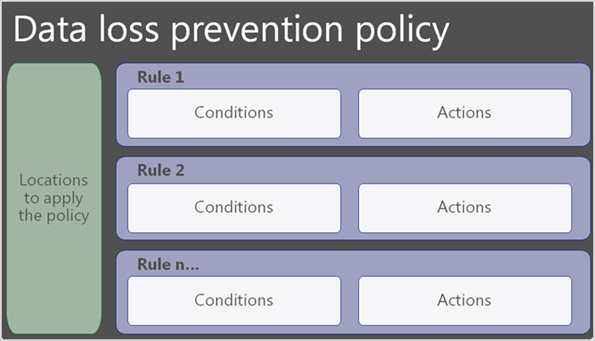 You can also change the priority of multiple rules in a policy. To do that, open a policy for editing. In a row for a rule, choose the ellipses (...), and then choose an option, such as Move down or Bring to last. After you create and turn on your DLP policies, you'll want to verify that they're working as you intended and helping you stay compliant. With DLP reports, you can quickly view the number of DLP policy and rule matches over time, and the number of false positives and overrides. For each report, you can filter those matches by location, time frame, and even narrow it down to a specific policy, rule, or action. Focus on specific time periods and understand the reasons for spikes and trends. Discover business processes that violate your organization's compliance policies. Understand any business impact of the DLP policies. In addition, you can use the DLP reports to fine tune your DLP policies as you run them. DLP detects sensitive information by using deep content analysis (not just a simple text scan). This deep content analysis uses keyword matches, dictionary matches, the evaluation of regular expressions, internal functions, and other methods to detect content that matches your DLP policies. Potentially only a small percentage of your data is considered sensitive. A DLP policy can identify, monitor, and automatically protect just that data, without impeding or affecting people who work with the rest of your content. After the policy's synced to the right locations, it starts to evaluate content and enforce actions. Across all of your SharePoint Online sites and OneDrive for Business sites, documents are constantly changing — they're continually being created, edited, shared, and so on. This means documents can conflict or become compliant with a DLP policy at any time. For example, a person can upload a document that contains no sensitive information to their team site, but later, a different person can edit the same document and add sensitive information to it. For this reason, DLP policies check documents for policy matches frequently in the background. You can think of this as asynchronous policy evaluation. As people add or change documents in their sites, the search engine scans the content, so that you can search for it later. While this is happening, the content's also scanned for sensitive information and to check if it's shared. Any sensitive information that's found is stored securely in the search index, so that only the compliance team can access it, but not typical users. 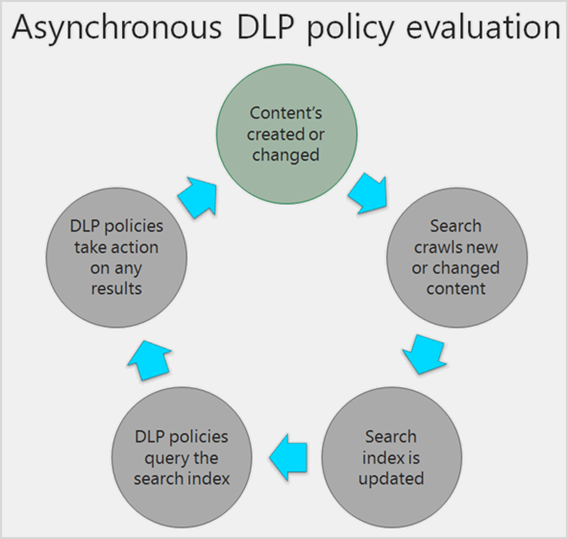 Each DLP policy that you've turned on runs in the background (asynchronously), checking search frequently for any content that matches a policy, and applying actions to protect it from inadvertent leaks. Finally, documents can conflict with a DLP policy, but they can also become compliant with a DLP policy. For example, if a person adds credit card numbers to a document, it might cause a DLP policy to block access to the document automatically. But if the person later removes the sensitive information, the action (in this case, blocking) is automatically undone the next time the document is evaluated against the policy. DLP evaluates any content that can be indexed. For more information on what file types are crawled by default, see Default crawled file name extensions and parsed file types in SharePoint Server. When you create a DLP policy that includes Exchange Online as a location, the policy's synced from the Office 365 Security & Compliance Center to Exchange Online, and then from Exchange Online to Outlook on the web and Outlook. When a message is being composed in Outlook, the user can see policy tips as the content being created is evaluated against DLP policies. And after a message is sent, it's evaluated against DLP policies as a normal part of mail flow, along with Exchange mail flow rules (also known as transport rules) and DLP policies created in the Exchange admin center. DLP policies scan both the message and any attachments. Excel, PowerPoint, and Word include the same capability to identify sensitive information and apply DLP policies as SharePoint Online and OneDrive for Business. These Office programs sync their DLP policies directly from the central policy store, and then continuously evaluate the content against the DLP policies when people work with documents opened from a site that's included in a DLP policy. DLP policy evaluation in Office is designed not to affect the performance of the programs or the productivity of people working on content. If they're working on a large document, or the user's computer is busy, it might take a few seconds for a policy tip to appear. When you create a DLP policy that includes Microsoft Teams as a location, the policy's synced from the Office 365 Security & Compliance Center to user accounts and Microsoft Teams channels and chats. Depending on how DLP policies are configured, when someone attempts to share sensitive information in a Microsoft Teams chat or channel, the message can be blocked or revoked. And, documents that contain sensitive information and that are shared with guests (external users) won't open for those users. For example, suppose that someone attempts to share sensitive information in a Teams chat or channel with external users. Suppose there's a DLP policy defined to prevent this. With protection in place, messages containing sensitive information sent to external users are deleted. This happens within seconds, and it happens automatically, according to how the DLP policy is configured. Policy tips notify senders about why their messages were blocked or revoked. For example, a sender might be told that their message contains personally identifiable information (PII) that is not allowed to be shared with anyone, or that a document that contains PII cannot be shared with people outside their organization. The sender can then edit their message to be compliant with DLP policies. Create a group in Office 365 and add compliance officers to it. 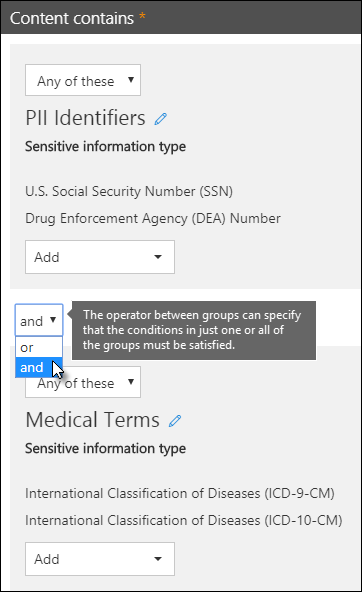 Create a role group on the Permissions page of the Security & Compliance Center. Add the Office 365 group to the role group. For more information, see Give users access to the Office 365 Compliance Center. These permissions are required only to create and apply a DLP policy. Policy enforcement does not require access to the content.